The title of the article might have come as a big surprise to you, but it is true. Facebook has inked a deal with popular antivirus software providers to let you download popular paid antivirus for free. As of now, the antivirus products that you can download free are McAfee Internet Security, Norton Antivirus, Trend Micro Internet Security, and Sophos Antivirus for Mac. Microsoft Security Esssentials is also available, but that is anyway free. 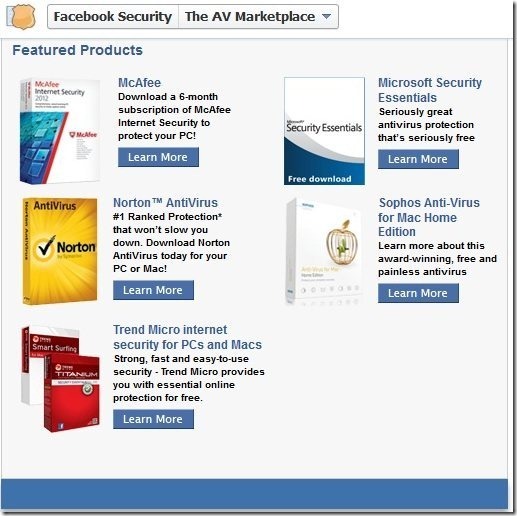 This is a great offer from Facebook, and lets you get your hands on some of the best antivirus products in the world for free. If you are on a free antivirus software, this is a great opportunity to try out a paid one; albeit for a limited time. And I am really happy with the product selection available here. These antivirus products are top of the line, and it is difficult to download McAfee antivirus free, or download Norton Antivirus free. Courtesy Facebook, it is all possible now. Also check out other Facebook security apps, like, BitDefender Safego, and ShareSafe. So, go ahead and download a shiny new antivirus for yourself for free, and protect yourself from malicious threats that crop up every day.